What is the Amazon Fire HD 6 Kids Edition? You can’t help but notice the number of kids playing with their parents’ or – the lucky blighters – their very own iPads or cheapo Android tablets. What, you haven’t noticed? 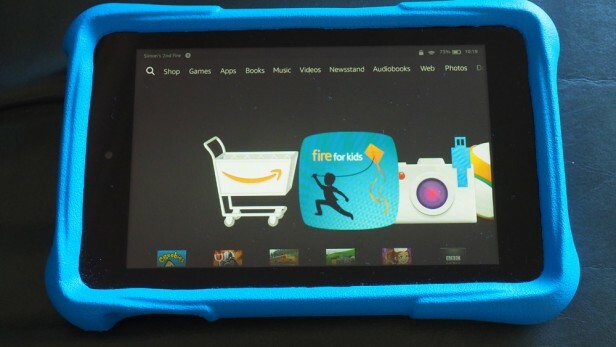 Well, Amazon obviously has, and is now offering a child-targeted tablet package. It’s basically an Amazon Fire HD 6 with a few added extras. 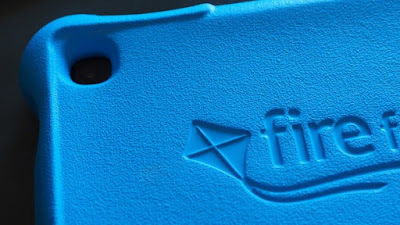 Most noticeably, you get a chunky case in a choice of blue or pink, but there’s also a year’s subscription to Amazon Fire For Kids Unlimited, giving access to a load of kiddy-friendly content. Finally, and actually probably most attractive, is a two-year warranty that promises a replacement tablet following any breakage, no questions asked. At the heart of this bundle is the standard Fire HD 6, which we’ve described in detail in our earlier HD 6 review. It’s a rather heavy, chunky 6-inch tablet. It feels better built than most, though, and its size and weight issues aren’t so relevant once it’s squished into the supplied Kids Edition case. On the top is the power button, a Micro USB charging port, a 3.5mm headphone socket and the tiny hole for the microphone. The volume controls are down the left. There’s a rather thick black bezel around the screen, within which is the front-facing camera, while you’ll also find a camera on the back, as well as a mono speaker. The Kids Edition case reminds me of a car dashboard, a little rubbery but still firm, and textured with that grainy, dimply pattern. Straight from the box it even has that new-car smell. Fitting it involves simply squeezing it over the edges of the Fire HD 6, which is easy enough. The lips that secure the case over the tablet are negligible, meaning you can pop the case on and off without much trouble. I worried about that at first. That big rubber bumper might prevent serious damage from an initial impact, but would the tablet then pop out and possibly take a knock anyway? I tried dropping it on a few different surfaces, but it stayed put. However, although the case protrudes from the front to help stop damage to the screen, there’s nothing to lessen a direct hit to the display from a table corner or random pointy toy lying on the floor. I’d have liked to have seen a screen protector bundled in, rather than as a £9.99 optional extra. Back on the upside, the Kids Edition case does make the HD 6 a lot easier for tiny hands to grip safely, which should help to stop too many drops from happening in the first place. In an ideal world, the case would have a simple kickstand to hold the HD 6 up on a table for video viewing. Realistically, though, that would probably involve a protruding part that’s easily snapped off, so I can understand why Amazon has chosen to keep things simple. Again, there’s not much more to add about the Fire HD 6’s 6-inch screen that we haven’t said already in our original review. It’s a 1280x800-pixel IPS display that offers a 251ppi (pixels per inch) resolution. That’s plenty sharp enough, especially for the type of content with which the Kids Edition will be faced, and it’s also bright, with decent viewing angles. It isn’t the very best for reading on, though, which is ironic when you consider its Kindle heritage. Fire OS is Amazon’s own operating system, based on Android – although you’d hardly know it. This is very much an Amazon experience, and as such is geared heavily toward buying the company’s wares and using its services. Amazon even has its own app store – no Google Play in sight. The homepage is dominated by a central carousel of recently used apps, while shortcuts to all major sections and Amazon services are along the top. The HD 6 uses a MediaTek quad-core 1.2GHz processor, with 1GB of RAM, which is easily enough power for a budget tablet – especially one that’s intended primarily to be used by children. For a full rundown on how the HD 6 and Fire OS perform in the hands of full-size humans, head to our review of the basic Fire HD 6. That one-year subscription to the Fire For Kids Unlimited service is the real reason young kids will love this tablet. 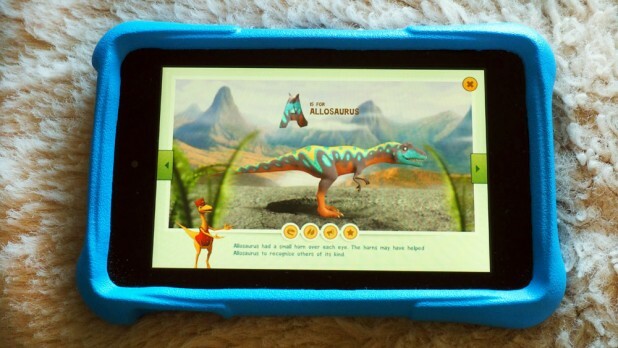 It’s essentially a simplified OS within Fire OS, giving access to tons of age-appropriate content. 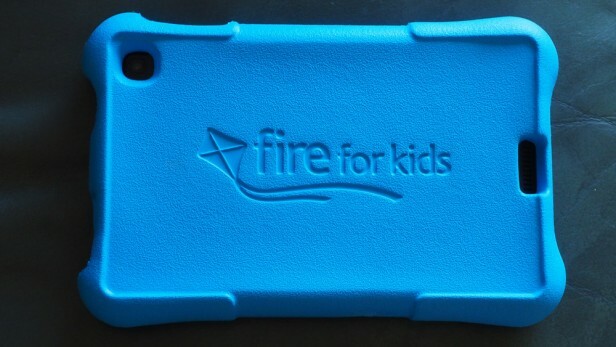 Fire For Kids is accessed initially just like any other app from Fire OS. Once it’s fired up you’re presented with the option to add profiles for each of the children who’ll be using the tablet. Once that child is signed in, they have five choices of content: Books, Videos, Apps, Camera, and Characters. They can also search by title. Whichever category you choose, the volume of content is impressive, and full of A-listers. Browsing by character reveals loads of familiar faces: Thomas the Tank Engine, Fireman Sam, Postman Pat, Gruffalo, Dora the Explorer and tons more, as well as categories such as Dinosaurs, Trains, Princesses, Sports and, er, Kittens. My two kids – aged 6 and 3 – didn’t seem overwhelmed by the huge selection, though. In that way children have of making you realise they’ll be showing you how new tech works before you know it, they were casually swiping straight to whatever caught their eye and just getting on with it. And much of the content was brilliantly engaging. If you yourself spent much of your childhood in the ‘80s, you’re also in for a special treat. My heart leapt with joy when I spotted, in the Videos section, the entire first series of Mysterious Cities of Gold. (I still dream occasionally of flying that golden condor…) Also, does anyone remember Round the Twist? Huckleberry Finn and His Friends? Those were the days. Handily, there are some customisations you can make regarding what your children can do and for how long. For instance, if there are any particular apps that your child likes which are outside of the Fire For Kids selection – such as CBeebies Playtime – you can simply add them to your child’s apps list. This is especially useful for supplying older kids with some more appropriate content, as much of the Fire For Kids stuff seems aimed at children aged 8 and under. However, as a safety precaution, you can’t add a web browser to a child’s profile – if you want to give them internet access, you’ll have to sign them into an adult user profile. Within the Fire For Kids Settings page, there’s also the option to Set Daily Goals & Time Limits. This lets you specify what time of day your child’s profile can be accessed, for how long per day, and whether you want to set them a goal, such as a minimum of 30 minutes reading books. It’s all very nicely thought out – which makes it even more of a shame that you only get a one-year subscription bundled in. Books download much quicker, though, and videos stream instantly over Wi-Fi. The latter does mean your little darlings won’t get to watch anything in the car or doctor’s waiting room, etc.